On 28 September, Hope Community Project was presented with the Queen’s Award for Voluntary Service at a ceremony attended by the Lord Mayor and the Deputy Lord Lieutenant of the West Midlands. The prestigious award is the MBE for volunteer groups. It is the highest award given to volunteer groups across the UK to recognise outstanding work done in their own communities. Bishop David McGough opened the ceremony by leading everyone in prayer. The Lord Mayor of Wolverhampton, Cllr Elias Masih Mattu (pictured below), then spoke. He praised the hard work and dedication of volunteers and of Sue Allen, Hope’s Project Manager. He said, “The special work of voluntary organisations brings change in the multicultural community of Heath Town.” He invited the volunteers to come for tea in the Mayor's Parlour. He described how many of those who were helped through Hope’s work are now helping others as volunteers. Praising their tremendous dedication, he said, “They give the most valuable thing they have got – their time.” He continued by saying that Hope sets the bar high and that this award is an enormous stamp of approval. 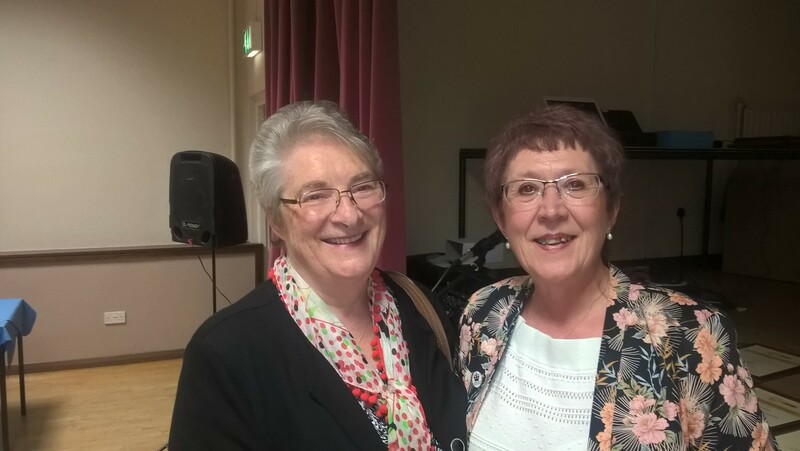 Volunteers were presented with certificates by Hope Community Project’s founder, Sr Margaret Walsh (pictured below with Sue Allen). They were recognised for their work with vulnerable and isolated people in Heath Town. The volunteers visit isolated elderly people, run friendship groups and lunch clubs, and work with children and young people. They also teach English and computer skills, work on reception and perform administrative work. Hope has been a part of Heath Town’s community for over thirty years, offering a hand of friendship and support to people who are isolated, vulnerable or at risk. They particularly work with vulnerable children and young people, older people experiencing isolation, women and families. The awards ceremony took place at St Patrick’s Church Hall and was well attended by volunteers and representatives from Hope’s two founding partners, Father Hudson’s Care and the Infant Jesus Sisters. Deputy Lord Lieutenant Sylvia Parkin also attended as well as Teresa Clements of Brushstrokes Community Project, and local priests from the Catholic and Anglican churches. Hope Community Project was founded as a partnership between the Infant Jesus Sisters and Father Hudson’s Care. It is now an independent charity with the same ethos and values. Working with people who are vulnerable, isolated or at risk it offers: lunch clubs, home visiting and day trips for older people; Petals of Hope women’s group; youth groups, after school clubs, trips, workshops and advice sessions for children and young people; gang prevention work with young people; tailored support for vulnerable women; IT tuition and ESOL classes. For more information about Hope Community Project, call 01902 556645, visit www.hopecommunityproject.org.uk or email enquiries@hope-cp.org.uk.